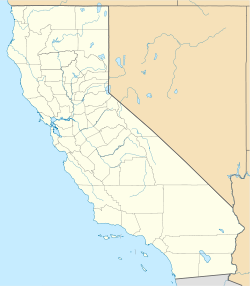 For the place in Kern County formerly with this name, see Midoil, California. Midland is a ghost town in Riverside County in the southeastern part of the U.S. state of California. It is adjacent to the Little Maria Mountains and located about 20 mi (32 km) northwest of Blythe. It is accessible from Blythe in the south via Lovekin Boulevard and Midland Road, and from Rice in the north via Midland Road. From 1925 to the 1960s, Midland was a company town owned by the U.S. Gypsum Co. The company had mined vast amounts of gypsum found in the area. Midland was also the site of a large plant that produced wallboard and plasterboard. For some time, there was a three part railroad between the quarry and the crusher, the last part being a 3 ft (914 mm) narrow gauge line running few miles. The town's water was shipped from Blythe by rail. At its peak, the town had a population of approximately 1,000. As the character of the gypsum found in the area was considered too heavy as the years went on, company activity in Midland subsided and then ended in 1966. Many winter scenes in Hollywood films during the 20th century utilized faux snow that originated from Midland. In the 1960s (before the town's demise), a gypsum mine 3 mi (4.8 km) west of the plant and abandoned in 1948 was converted into the largest fallout shelter in the county. Most of the buildings of Midland were torn down, and today only foundations remain. In 1970, a 150,000 gallon water tank from Midland was moved on skids by tractor to the new Mesa Ranch Mobile Home Park and a housing site in northwest Blythe. Hillinger, Charles (November 2, 1970). "Don't Go To Midland – It's Gone". The Los Angeles Times. "Midland". The Center for Land Use Interpretation. ^ David F. Myrick (2001). Santa Fe to Phoenix: Railroads of Arizona. Signature Press. ISBN 978-1-930013-05-6. ^ Valdez, Juanita (1988-06-29). "Ghost town remains north of Blythe". Palo Verde Valley Times. ^ "Midland Fallout Shelter: The People, The Mine, And The Bomb". Palo Verde Valley Times. 1965-09-09. ^ Front page picture in the Palo Verde Valley Times, December 10, 1970. This Riverside County, California-related article is a stub. You can help Wikipedia by expanding it. This California ghost town-related article is a stub. You can help Wikipedia by expanding it. Midland California, a place where people come to die. Full of hookers and crackheads. You will enjoy your stay here at Midland, if i'm being honest here the only reason im writing this is because its the 25th day without food here. Food trucks stopped coming because nobody was paying them. People started turning on each other, almost the whole town are cannibals now. If you're reading this.....YOU ARE THE RESISTANCE. Five days later.... Dog has never tasted so good. Completely out of food and people, we are now eating dog hair sandwiches. With...Mustard...the intense taste of mustard is the only thing keeping us from gagging. please help my brother is starting to look really delicious. This page was last edited on 25 January 2019, at 15:45 (UTC).